Heurista is your donor relations advocate! ADRP - Heurista is your advocate! The 10th annual ADRP conference in Providence, Rhode Island is now a pleasant memory and we each face the challenge of deciding how we will advance our careers and the profession in the months and years ahead. We enjoyed the hospitality of our host city and the opportunity to reconnect with our peers. Thank you all for your participation and congratulations to the 2013 conference committee and the many volunteers who made the conference a success! Heurista serves as your advocate for better donor relations and stewardship with architects, administration, facilities staff, IT professionals and marketing teams. You need an expert from "the outside" to navigate your complex projects, freeing you up for your everyday work. Heurista has the experience needed to negotiate internal and external politics and we "speak the language" of the many stakeholders who need buy-in on the outcome. We are familiar with projects that involve process design, product purchases and brand or architectural integration. Moreover, we provide expertise in philanthropic storytelling and a talent for converting your ideas into tangible user experiences. If your project would benefit from specialized design, copy writing, media production or project coordination, call Heurista. We are the advocate you need. 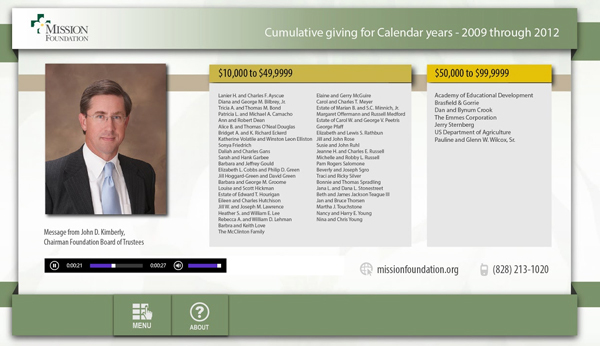 During construction of the Mission Cancer Center, the Mission Foundation received the largest gift in the hospital system's history – and encountered a number of factors to complicate awarding the naming opportunity. First, the donor, a credit union, wished to honor its members through the recognition display, asking for a solution that would highlight a rotating set of individual members. Internally, marketing was concerned about the implications of a corporate name on one of their strongest service lines. Additionally, facilities held fast on new standards for signage, while the Foundation wanted to implement new standards for donor recognition. Anne was engaged to propose the solutions and negotiate agreement between the various parties. Expertise in recognition product solutions and industry best practices allowed her to bring good ideas to the table, but it was her skill in listening to and addressing the concerns of each stakeholder in the project that brought the greatest success. 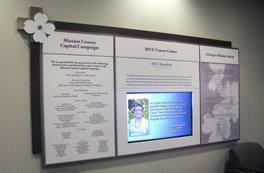 Recently, Mission expanded their recognition program with the addition of a beautiful exhibit to recognize donors and volunteer leadership and inform the public of current philanthropic initiatives. Heurista presented the concept, negotiated with the executive leadership team, sourced the local artists and coordinated with the facilities and engineering teams. 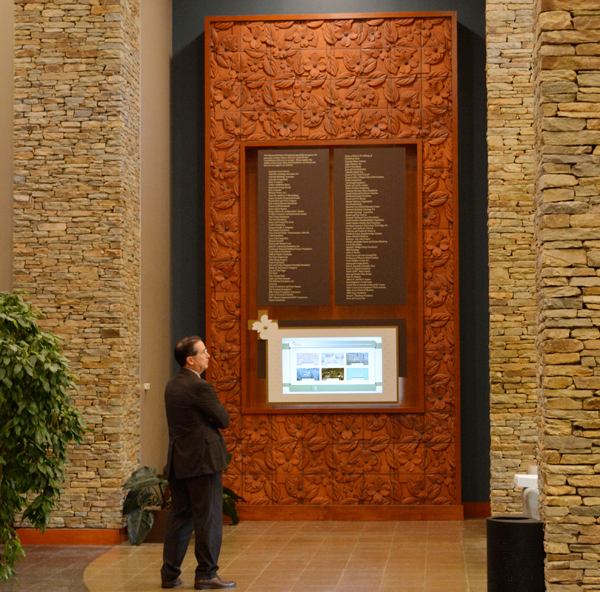 The finished display features custom terracotta tiles to highlight the hospital's dogwood and cross logo and interactive media that allows the Foundation to conveniently recognize lifetime giving. Donors at the highest level are also presented on changeable panels appropriate to the scale of the lobby. With Heurista as your advocate, you can achieve even more than you'd imagined! If you have a complex project in your future, you need the experience, creativity and skilled advocacy only Heurista can offer. Call today to discuss what you see on the horizon. Visit Heurista.com and sign up to continue receiving our newsletters.